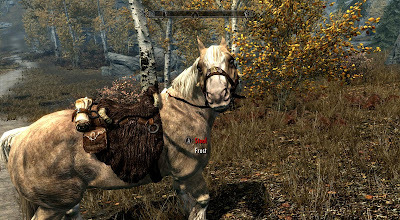 In Skyrim you can get a Free horse by completing the mission called "Promises to Keep"
"Louis Letrush wants me to ask Sibbi Black-Briar about Frost, a breeding horse Letrush is buying." "Bee and Barb" near one of the entrance doors. He'll ask if you're looking for any work. Accept his mission then travel to the Mistivel Keep to talk to Sibbi Black-Briar. Once you're done travel and get the key to the place from one of the mercenaries outside. Once inside head down some steps, go into sneak mode and grab the papers and the loot from the chest (which you should have gotten the key for from the guy in jail). Then make off with Frost, the horse. When you meet up with the guy persuade him to give you Frost or just kill him on the spot, personally I prefer to do both. Once you have your ride you may want to work on getting a home, and a woman too.